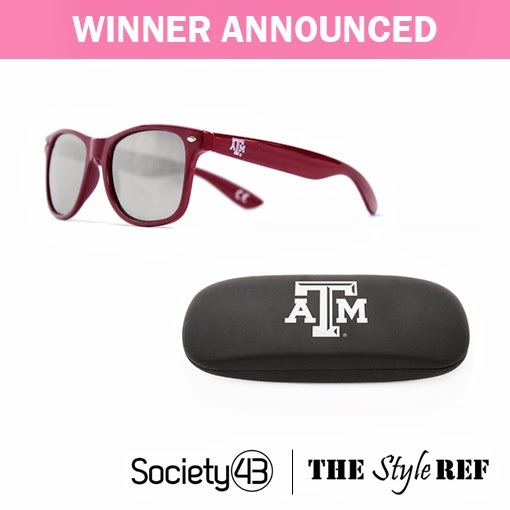 Thank you to everyone who entered last week's Society43 Sunglasses & Case Giveaway! One TSR reader will be sporting a stylish new pair of college team shades with a matching case for storage. Congratulations, Evelyn! You'll receive an e-mail shortly with details about how to claim your prize. Once you get your new sunglasses and case, show them off and share a photo on TSR's Facebook, Twitter or Instagram (#TheStyleRef)! More fashionable fan giveaways are coming up, so stay tuned to TSR! Hi Kathy, Thank you for the giveaway. I am so excited to have won this awesome prize. I wish you could have seen my face when I saw my name. It was Priceless, I'm sure! Well, I live right outside New Orleans, so I'm a Hugh LSU Tiger fan. Yep, My team is LSU, I hope they have an LSU case! My shipping address is: Evelyn Chuter 619 Manson Ave. Metairie, Louisiana 70001 Thanks again and Please let me know that you got this message. Hi Evelyn! I'm glad you're excited! I sent you an e-mail with details. They have various sunglasses styles to choose from, so check the e-mail and let me know which you prefer! Cute sunnies! I'm wayfarer addict, I remember my pair of Oakley Frogskins.